WHO'S IT FOR? Ideal for all skin types: normal/combination, dry, aging, and environmentally damaged skin, oily/acne, sensitive. WHAT DOES IT DO? Repairs the skin’s damaged collagen and elastin. With aging we loose our natural supply of Coenzyme Q10 and with it goes the building blocks of collagen and elastin that holds our skin firm and tight. 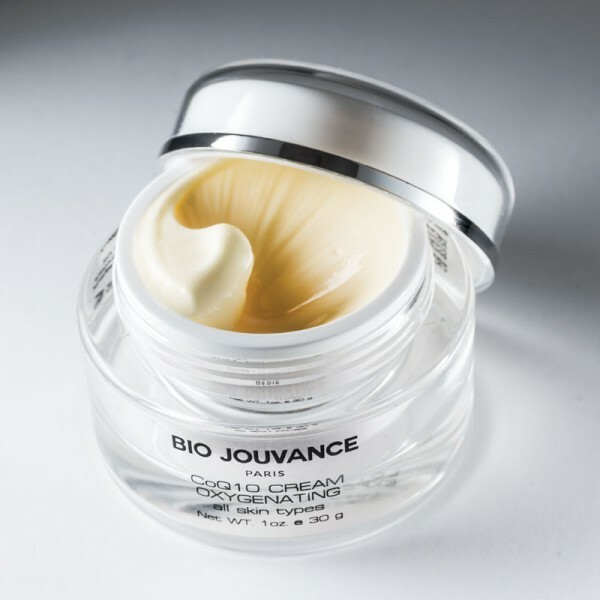 Because of its small molecular size Bio Jouvance Paris CoQ10 Oxygenating cream is able to deliver a potent CoQ10 formulation directly to the cells keeping the skin plump and hydrated. This formulation is also works as a powerful anti-oxidant protecting the skin from free radicals, the toxins that we come into contact daily. Coenzyme Q10: Found in every cell of the body, Coenzyme Q10, or CoQ10, produces cellular energy to help cells grow and maintain their health. Jojoba Oils: A rich emollient infused in CoQ10 Cream is added for its extreme hydrating capabilities. Unlike traditional oils, Jojoba Oil is thicker in consistency and mimics the skin’s texture to lock in moisture and create a protective barrier. Apricot Kernel Oil: A cold pressed ingredient known for being a very light weight moisturizer and emitting pleasant fragrance. Its light weight molecules are easily absorbed by the skin without leaving behind a greasy residue. Hyaluronic Acid: Another substance naturally produced by the human body to keep skin looking more youthful. Like CoQ10, the production of Hyaluronic Acid declines over time. Hyaluronic Acid helps the skin to take moisture from the air and hold on to it to ensure that the skin stays properly hydrated at all times. HOW DO I USE IT: After cleansing and toning, apply a small amount on face and neck morning and night. Massage over skin. Avoid eyes.